The value of a Felling Big Trees - 20 cents 1946 stamp depends on several factors such as quality and wear, supply and demand, rarity, finish and more. Values in the section are based on the market, trends, auctions and recognized books, publications and catalogs. This section also includes information on errors and varieties and characteristics. 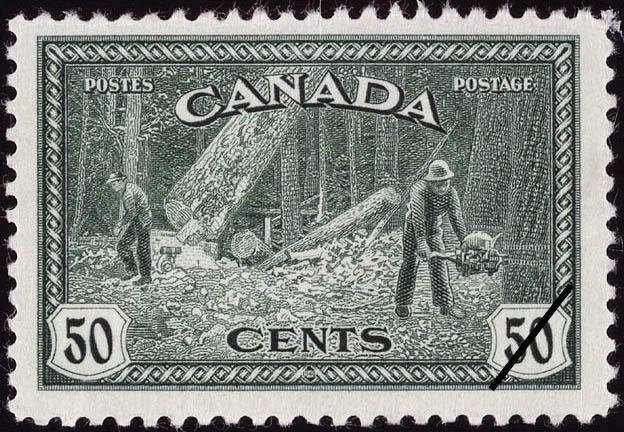 On this stamp, a view of logging operations in British Columbia. The design stresses the background of the Canadian lumbering and pulpwood industries, major factors in Canada's manufacturing activities and export trade.